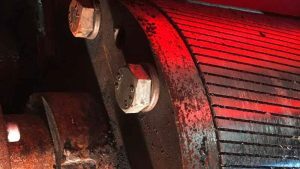 It has been in operation at KURZ Karkassenhandel in Landau since March 2016: Europe’s first and currently only rubber fine grinding system for HGV rubber peelings. This term refers to the black strips of rubber which occur when HGV tyres are peeled lengthways. The machine on the KURZ company site is a real workhorse: With 144 rotor blades and seven stator blades, it grinds rubber peelings into coarse granulate within just a few minutes and then into fineness of up to 0.4 mm. KURZ Karkassenhandel is therefore an important German producer of the material, for which there are a wide range of uses. The granulate can be used to manufacture carpet underlay, mouse pads, door seals, sports facility surfaces, water hoses, fences and toys, among other things. We know the soft mats that prevent injuries in the event of falling in swimming pools or on children’s playgrounds. However, the rubber powder can also be used in road construction: When it is added to bitumen it reduces noise, prevents the creation of ruts, has outstanding drainage capability and makes the road surface significantly more hard-wearing. Scientific investigations have shown: If “rubber asphalt” is used consistently, the cost of maintaining the road network is reduced, and road works and traffic jams are prevented. Then two main methods are: cold grinding and warm grinding. 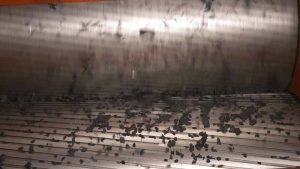 In the cold grinding process, the pieces of rubber are made brittle using liquid nitrogen and then ground in a hammer mill. As well as the additional costs which are incurred for producing the liquid nitrogen, the disadvantage of this production method is the small surface size of the individual grains. Warm or ambient grinding does not require expensive liquid nitrogen and operates at room temperature, as the name implies. The rubber is ground in several mills connected in series until the required grain size is reached. The fine grinding system at KURZ also operates in accordance with this principle. 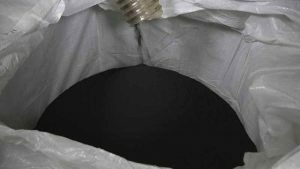 The finished rubber powder is packed into suitable sacks in the required quantity directly from the collection vessel and then delivered to the relevant companies, who then process the raw material. After a short test phase, during which the personnel were familiarised with the operation of the powerhouse and any teething troubles were dispensed with, the fine grinding system has become an important constituent of the business and a sensible additional service for customers. In other words, an investment which has certainly paid for itself. KURZ Karkassenhandel does not just have decades of experience in scrap tyre disposal. We also take care of other rubber waste with the same precision and professionalism. Everything that is bulky and requires professional disposal is in good hands with us. 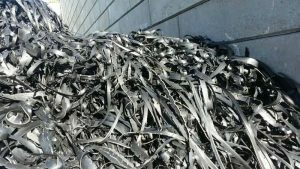 We ensure that waste rubber without attachments, such as conveyor belts and excavator tracks, gets into the right hands – for the sake of sustainability. 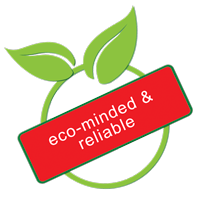 Thanks to its long company history, KURZ Karkassenhandel has an excellent, tightly woven network of reliable disposal and recycling companies, who collaborate closely with us. Our company sites in Wendlingen and Landau are also big enough to store scrap tyres or containers over long periods. If required we will provide containers, deliver them to you or pick them up. In this way we jointly make the contribution that is needed for maintaining the valuable material cycle of taking recyclable materials for re-use and others for thermal recycling. The recycling options are in a continuous state of development: The mountains of waste that previously towered over the tip can now be turned into secondary building materials, for example, using new technological developments. This another reason why it is important for you to turn to a professional with your rubber waste.